In the Stone Age computer text was punched into paper cards with keypunch machines. The text was carried as a physical box of these thin cardboard cards, and read into a card reader. The first text editors were Line Editors oriented to teleprinter- or typewriter- style terminals without a display. On some line editors, the cursor could be moved by commands! Line editors drastically improved text editing. In 1982 the Personal Editor was developed for PC DOS, the IBM operating system for their first personal computers like IBM PC, XT, or AT. Limitations in Personal Editor led to the development and release of the E-Editor (E.exe) in 1984, a much faster editor that supported very long files and included a substantially enhanced user interface. The story of the E-Family began and has not yet ended. are a perfect way to quickly write down a basic idea for further platform-independent usage with all other apps like an E-Mail client, a grown-up word processor like Apple’s Pages, or a mind mapping tool like iThoughts. Formatting can be done later. For Apple’s iOS devices I reviewed three apps supporting barrier-free text editing for users aged from 4-104. The encoding has traditionally been either ASCII, one of its many derivatives such as ISO/IEC 646 etc., or sometimes EBCDIC. Unicode-based encodings such as UTF-8 and UTF-16 are gradually replacing the older ASCII derivatives limited to 7 or 8 bit codes. See these screenshots to get an impression of the different UIs. 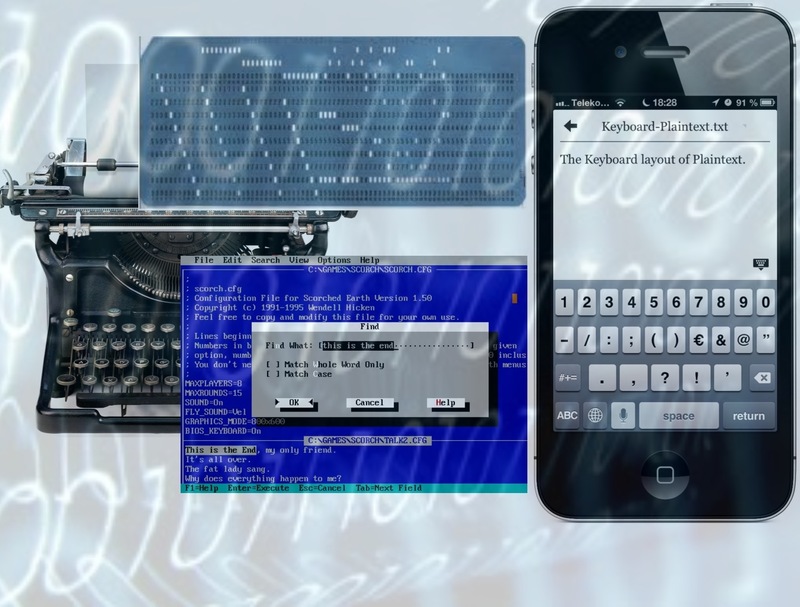 Here is a comparison of two of the simple text editors for the iPhone and the iPad. I excluded WordEver from this comparison as it is a non-universal app and expensive. 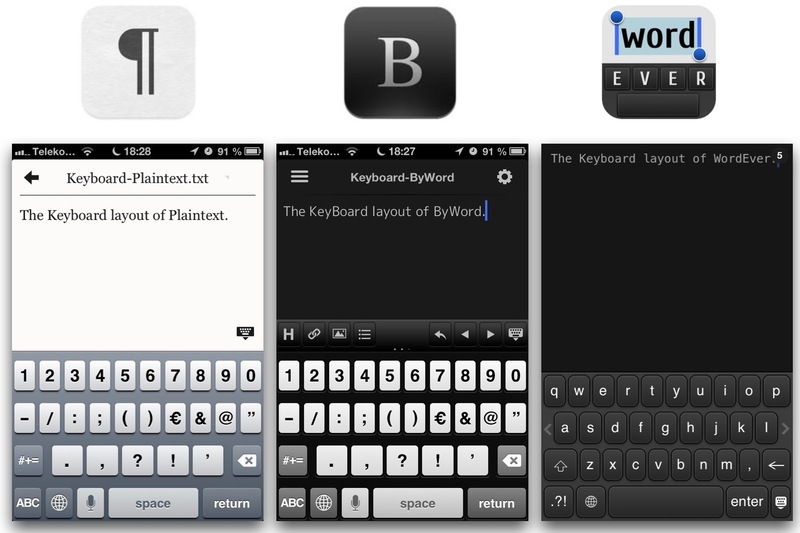 A great disadvantage of WordEver is the keyboard which was redesigned in May 2013. I had massive problems to use it on an iPhone because it doesn’t follow the standards and it is a bit smaller than Apple’s built-in keyboard. 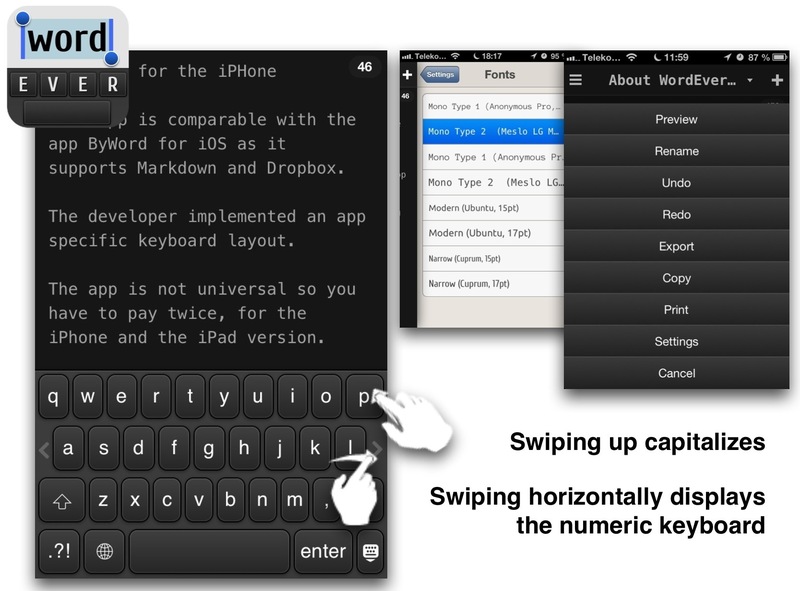 Every time you move from WordEver to any other app you have to change your mind when using the standard keyboard. Swiping up on the WordEver keyboard writes the capital letter while swiping up on the standard keyboard writes German umlauts or nothing on an English keyboard. After a short time it’s considerably nerving. For me it’s an absolute NO-GO to use different keyboards on the the same device except there are some useful keys added to the standard layout. Refer to these screenshots to get an impression of WordEver’s UI. 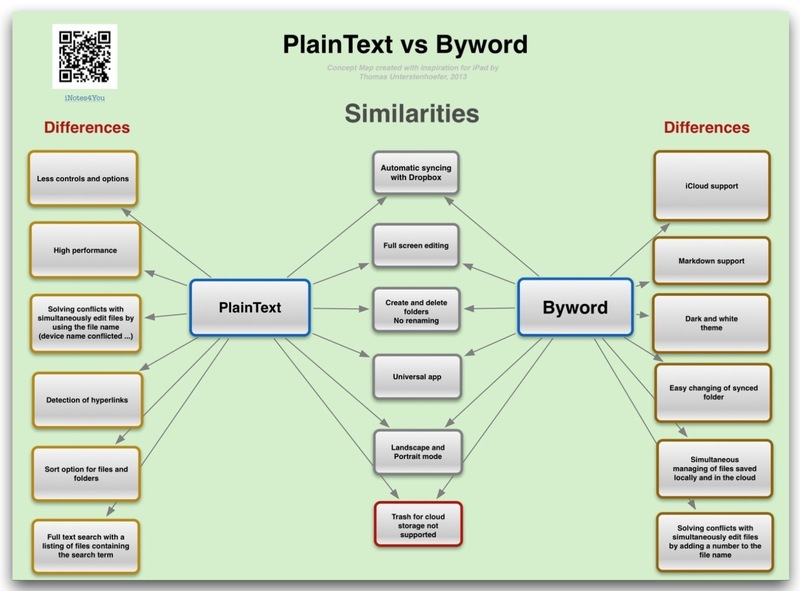 This concept map shows the main differences of the two remaining competitors, PlainText and Byword. This app can be compared with Microsofts dinosaur app EDITOR or IBMs E-Family of simple editors. I myself use PlainText for writing down ideas for blogs. There are no further functionalities available (except full screen display) not even formatting and so you have to completely focus on the contents. Saving of text is automatically and frequently done by PlainText in a folder called PlainText on Dropbox. The folder can be changed by Unlinking from Dropbox and linking again. It’s all automatic (except writing the text, unfortunately). This app is also suitable for teaching children in writing text. The pupils should recognize that relevant functionalities for collaboration are missing, e.g. who edited existing text and what part of the text was changed. Text editors are generally not multi-user capable. In the case of using iCloud or Dropbox for saving the text files problems usually do not occur as just one user has access to the storage and he normally won’t work on the same file at a time on two devices. But if you stop working on one device while the text file is still open and then continue working on the same file on another device conflicts may appear. 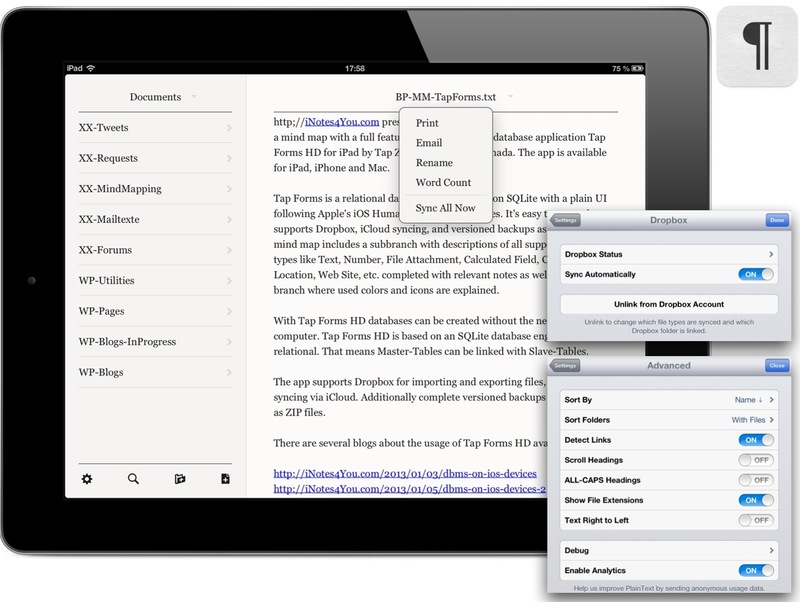 Both apps, Plaintext and Byword, solve these conflicts by creating device specific versions of a file. PlainText adds the device’s name to the text file and so no content gets lost. The user can decide with which version he wants to continue his work. PlainText provides a Search function. After entering the search term all files containing the search term are listed. Unfortunately hits within a file are not highlighted. WordEver is expensive and not universal. Additionally the iPhone keyboard layout is too small and not standard. If you use WordEver you have to switch between Apple’s keyboard layout and that of WordEver. On my point if view that’s a disadvantage as it decreases the usability. If you use Markdown language to format your text you cannot take it over to other apps not supporting this feature e.g. Apple’s Pages or apps which are Microsoft Office like. Additionally markdown is far away from what is a standard since many years: WHYSIWYG (what you see is what you get). So my preferred app is still PlainText although there are limitations in the file management. It’s surprisingly simple and near to a text processing multi-user environment. It’s a pleasure to see you visiting my site.